It’s Halloween time and we are getting pretty excited over here at The Paper Mama home. We have pumpkins EVERYwhere, and we plan on making a yarn spiderweb tomorrow. So much fun. 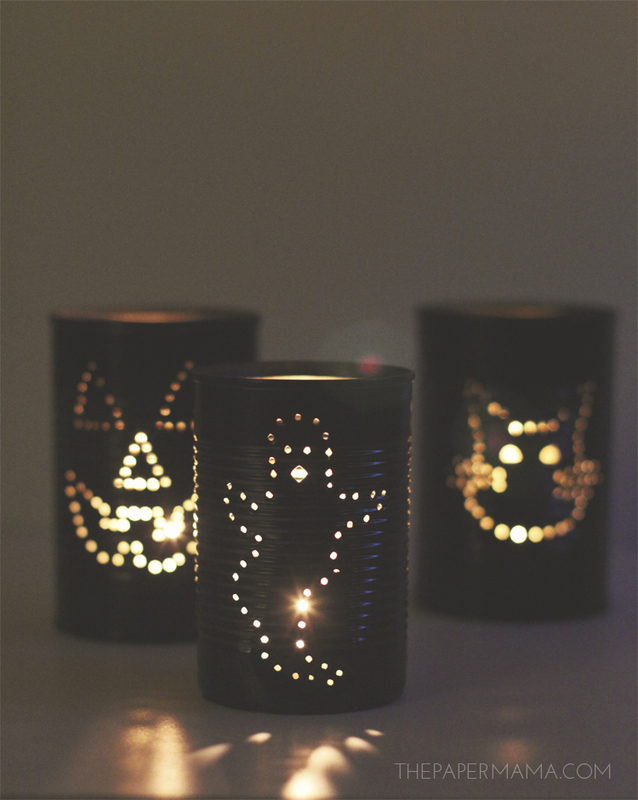 You won’t be able to see all those decorations at night, so that’s why I made these Spooky Tin Can Lanterns! Since this project is made from recycled cans and a coat of paint, the cost of materials is so low. In fact, I already had all the items I needed in my home (plus I got to eat some soup for lunch). These could be so cute lined along your walkway for trick or treaters! Clean up your cans! Use warm soap and water to remove any glue, food, and paper from the can. Cut out the spooky lantern shape you’d like to use. Tape the shape over the outside of the can. Tip #1: the printable patterns I provided will print out around 3 inches wide. If you need the images smaller, adjust the scale before printing. While wearing your eye protection and gloves, place the can on the towel (this will help with slipping) and use your nails and hammer to punch out the holes into the shape of your pattern. Tip #2: I really recommend eye protection and gloves. You’re hammering a metal can and that means little metal slivers. Safety first! When your can is all punched out, let’s paint! In a well ventilated space (preferably outside) and wearing a mask/eye protection, spray two coats of black spray paint onto the outside of the cans (follow the spray can directions on the back of the can). You can always create your own pattern! IF you make these let me know. I’d love to see how it turned out. P.S. I am a paid contributor for the HP Create blog. I have two can ready to create bu I can't seem to get to the original post at HP. Have they taken it down so soon?